Anterior refers to a front-side approach to the neck, as opposed to the back-side. Cervical refers to the 7 vertebrae of the neck. Discectomy refers to removal of the disc material and/or bone spurs between the cervical bones. Fusion refers to fusing the two vertebral bones adjacent to the disc (i.e. above and below the disc). The most common diagnoses that patients have who undergo an ACDF are cervical disc herniation or stenosis, which cause compression on the nerves or spinal cord. The surgery is designed to remove all of the disc material and/or bone spurs at a particular segment of the spine thereby removing the pressure on the nerves. Once the disc material is removed, the disc joint needs to be stabilized via a fusion. This entails inserting a graft between the vertebral bones to act as a spacer and maintain the joint space height. The segment is then preliminarily stabilized with a low-profile plate and screw construct. 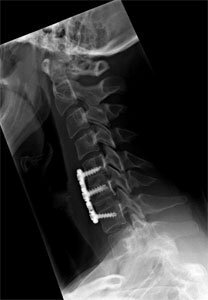 With time and healing, new bone will grow to join the vertebral bodies together so that what were once two bones will now act like one. One Hundred percent of our patients have had pain reduction with an ACDF surgery with an average pain reduction from 6/10 pre-op to 2/10 post-op. This is a case of a 33 year-old female with excruciating neck and left arm pain and weakness. The pain radiated down to her thumb and middle finger. She had an MRI that demonstrated an eccentric to the left disc herniation at C5-6 (Figure 1) and a central disc herniation at C6-7 (Figure 2). She had failed non-surgical management in the form of medications, injections, and physical therapy. She ultimately underwent a 2 level ACDF at C5-7. She immediately noted increased strength and decreased arm pain after the surgery with only a mild amount of neck discomfort. Figure 1. 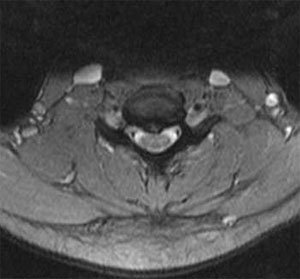 MRI image through C5-6 demonstrating left sided disc herniation. Figure 2. 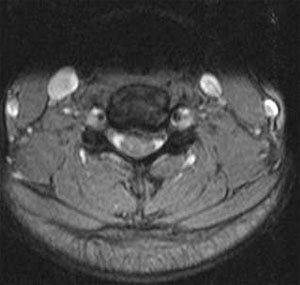 MRI image through C6-7 demonstrating central disc herniation. Figure 3. Lateral X-ray after 2 level ACDF.